Starting September 2, 2014 Small Business customers can take advantage of Spencerport Municipal Electric’s (SME) LED Light Bulb Initiative. The intent of the program is to provide Customers with the latest type of lighting technology. 1. There is no cost to the small business owner to participate in this program. 2. Save each month on your utility bill by reducing lighting consumption by up to 50%. 3. SME personnel shall perform the installs and remove any old fluorescent lighting and recycle those in an environmentally friendly manner. 4. After completion of the project, business owners will receive a summary report of their potential energy savings. 5. 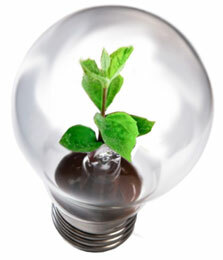 In some cases where LED lighting is not applicable, other methods of energy efficiency will be considered. 6. Improves the environment and helps our local business economy. 1. Participants must be small business owners who are a SME customer. Small business owners are defined as Service Classification 2 or 3 who use 20 kw demand or less monthly, are locally owned and operated and not franchised companies. 2. Businesses that have previously received SME/IEEP rebates of $500 or more within the last five years are ineligible for this program. 1. The total amount of SME/IEEP funds established for this program is $30,000. 2. Small business owners can receive up to $500 of LED lighting products provided by SME. Any location that may exceed the $500 limit will be at the SME Superintendent’s discretion based on a cost analysis. 3. The program shall continue for two years or to a time when funding is no longer available. In situations where LED conversions are not applicable, normal IEEP rebates for commercial customers will apply. 1. If you would like to schedule an appointment to see if you qualify, please send an email to dpwelectric@vil.spencerport.ny.us or call the Electric Shop at 585-352-6775, Monday through Thursday 9AM-2PM or Fridays 9AM to 12 Noon.